OK, perhaps saying the air quality in Penticton is almost as bad as Beijing is a bit of an exaggeration, but when the smoke rolled in yesterday from a forest fire near Omak, Washington (the picture to the left shows the leading edge of the thick layer of smoke)- the air quality and visibility in Penticton took a huge nosedive. Earlier in the week, skies were a little hazy due to smoke from forest fires in California and Oregon, but at least there wasn’t an obvious smell of smoke in the air. According to reports from the Kamloops Fire Centre, points south in the Okanagan valley were getting hot ash dropped on them. The wildfire started last Thursday on the Colville Indian Reservation, which is about nine miles west of Nespelem and has burned 19,500 acres as of this morning. Reports stateside indicate that 300 firefighters and air tankers are to be working on the blaze today. Such a shame that Washington State obiously doesn’t have the resources to contain fires earlier in the game – ’cause if it’s bad here, it’s worse there. 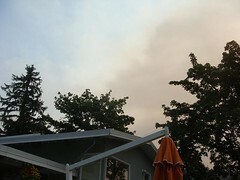 Click here to see more pictures of the smokey Okanagan valley.